Tenecula, Calif.––U.S. Marine Corp Chaplain Mark Beaudet received and distributed 25 copies of Strength for Service to God and Country to members of the First Battalion 11th Marines. The books were provide by St Louis-based World Wide Technology with shipment paid by donations to the Nashville-based Strength for Service Corporation. Beaudet is on his second career with the Armed Services. He served from 1994 to 1998 as a religious programs specialist at a U.S. Naval Hospital in Guam. At that hospital, he worked with Chaplain Noel, the first Navy Muslim chaplain, to set up a family relief center for Korean Airline 801 crash victims. He separated from the Navy in 1998 and went to work as a youth pastor with two churches while earning his Bachelor of Science Degree from Colorado Technical University in 2005. Three years later he received a Masters of Divinity degree from King’s College and Seminary in Van Nuys, Calif. Following his ordination in the International Church of the Foursquare Gospel and training at the chaplaincy school at Fort Jackson, S.C., Beaudet was commissioned as a chaplain in 2010. He then was stationed with the USS Ashland in Sasebo, Japan, as command chaplain. He currently serves as chaplain at 1st Battalion, 11th Marines. 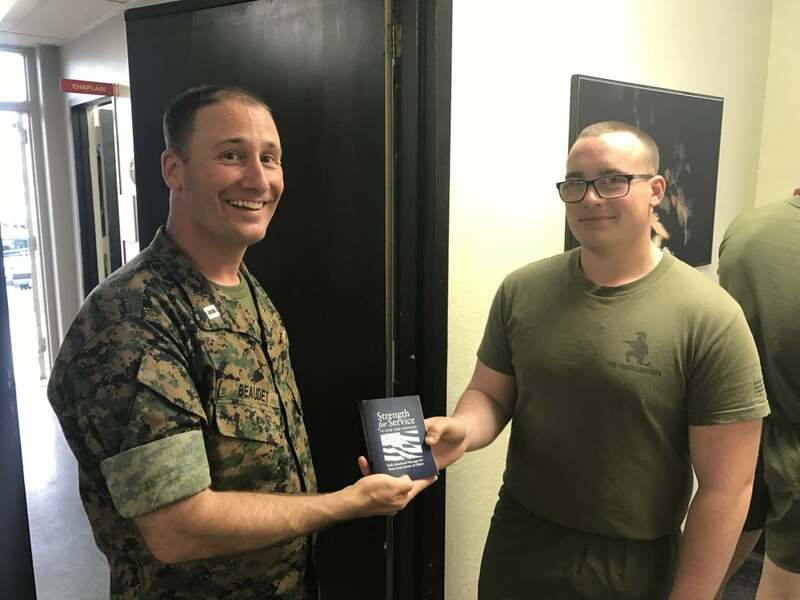 Chaplain Beaudet (left) hands a copy of Strength for Service to a marine at his office in Tenecula, Calif.